Buy 1 oz 2014 BitCON Silver Rounds | ?? 1盎司2014年比特币银圆 The first release in the new Silver Shield series wastes no time and brings forward the crux of the argument. 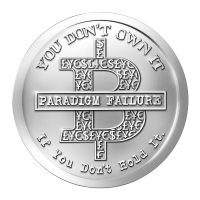 "You Don't Own It If You Don't Hold It" is engraved around an outlined capital B (meant to bring Bitcoin to mind). Inside this symbol are symbols of different currencies, cleverly arranged to spell "eyes". This interconnectedness of Bitcoin and the fiat currencies of the world demonstrates the author's belief that Bitcoin is no better. Chris Duane had this to say about Bitcoin: Thomas Jefferson said that paper is the ghost of money. Well I say Bitcoin is the illusion of the ghost of money since it is further removed to the real wealth of gold and silver. Just like I am sure the Silver and Gold ETFs were used to distract real dollars from physical gold and silver, I believe this lotto fever for Bitcoin has distracted a good many freedom minded people away from silver and gold. The good news is that as people sour on this fad, they will look to take their Bitcoins and cash them in. I have had more than a few confess to me that they are doing just that. And do we really believe all of these pundits that have been hyping Bitcoin aren't doing just that? I mean come on they made a living from pushing gold and silver, but the real money is made in hyping Bitcoin rather than the small margins on selling real metal. There will come a time when even the most die hard promoter of Bitcoin will see the diminishing returns in pushing Bitcoin, and will move on. I am sure a good many of perceptive eyes will see through this and these men have sold their reputation for a quick buck. When the music stops the whole world will finally realize that when it comes to real wealth, You don't own it, if you don't hold it. The 2014 Silver Shield BitCon is the first low premium Bullion Strike of the series and will be available all year. The bullion strike of this round is intended to allow for a dramatically lower premium compared to the BU and Proof-like strike of Other rounds in the series. This round is perfect for silver stackers with the lowest premium of any round in the series.